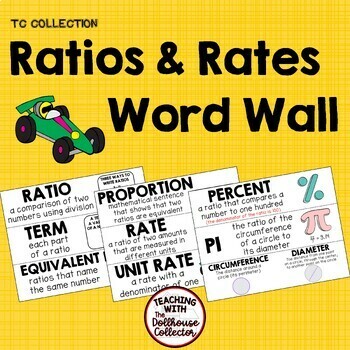 This download includes 17 "sentence strips" for your MATH word wall. Each strip measures approximately 11 in x 2 5/8 in (280 mm x 68 mm), and will fit in most pocket charts. Strips could be laminated or printed on card stock for durability. They could also be shrunk down to fit in students' notebooks, or enlarged as a poster. Each strip displays the name, definition/description, and a visual representation. * EXPRESSIONS & EQUATIONS TASK CARD BUNDLE. Don't forget to leave feedback so you can earn credits towards future TpT purchases! Just go to "My Purchases" and click on the "Provide Feedback" link under this product title. Follow me to be the first to know when new products are posted! Click on the green star under my name. ***This product is a part of THE TC COLLECTION that my colleague and I are currently developing. The resources in this collection will have the same style so your word walls and bulletin boards will have a consistent theme.